CDR Yamaha riders Mosig and Reardon split wins in dramatic round. CDR Yamaha duo Kade Mosig and Daniel Reardon scored an MX1 win apiece at Appin’s second round of the 2015 MX Nationals today in New South Wales. The overall went to Mosig, his second since Swan Hill last season, as the overall podium featured the same three riders as Horsham – Mosig, Kirk Gibbs and Luke Styke – a fortnight ago. A dramatic start to the opening premier class moto saw reigning number one plate holder Matt Moss go down in the first turn, out of the race and transported to hospital for scans after undergoing treatment from Suzuki RACESAFE. The win eventually went to Mosig in another strong showing for CDR, finishing near four seconds ahead of Styke and Gibbs, a further two seconds back. Gibbs put in an exceptional performance to come from the rear of the field for third after he too was caught up in the first turn incident. Fourth was teenager Jesse Dobson on his Husqvarna, while longtime leader Lawson Bopping was forced to settle for fifth at the close of the moto. Completing the top 10 were Dan Reardon as another to be involved in the turn one melee, Dylan Long, Adam Monea, Cody Cooper and Kale Makeham, who was also a fast starter. The second MX1 moto was all Reardon at the front, dominating from the outset to hold Gibbs at bay for his first race win upon return to racing. Behind Reardon and Gibbs was the ever-consistent Styke third, while fourth for Reardon’s teammate Mosig secured him the overall round win. Fifth was Dobson in another exceptional ride for the round, trailed by Bopping, Makeham, Monea, Long and Cooper the top 10. The overall podium eventually resulted in Mosig with the overall from Gibbs, who got the better of teammate Styke on countback. In terms of the championship, it’s now Gibbs with a 14-point buffer from Mosig and Styke. Yamaha duo Clout and Wilson duke it out for the overall. 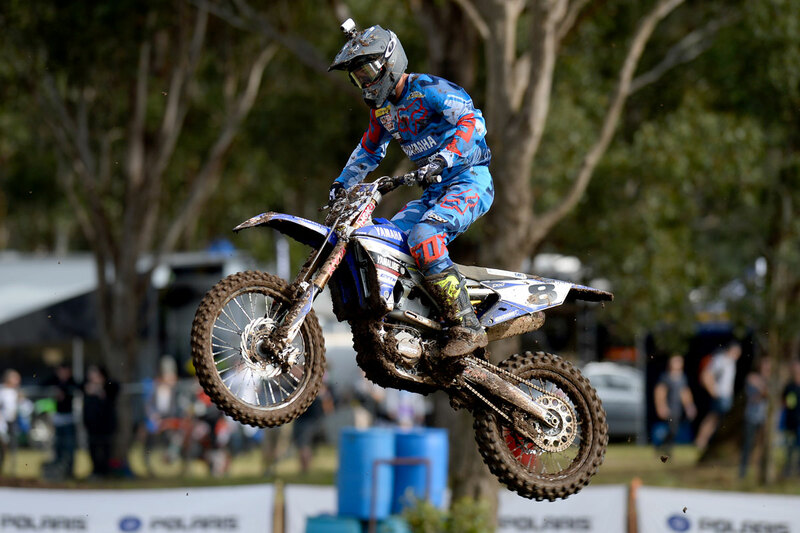 Serco Yamaha’s current MX2 MX Nationals champion Luke Clout has claimed an emphatic overall round win at Appin today to reclaim the series leader’s red plate. 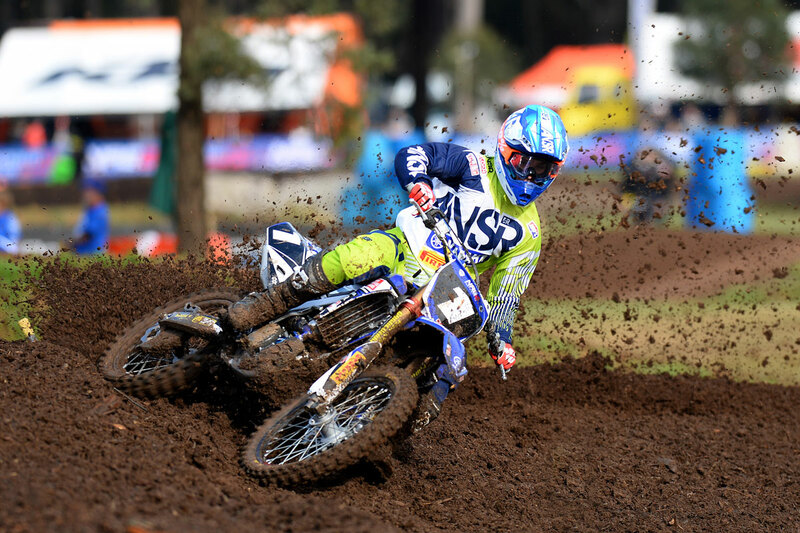 Jay Wilson claimed an inspired opening moto victory for JCR Yamaha, fending off defending champion Clout in the closing laps to open his account for the year. Wilson led early before Clout made his way through, however he soon stalled and allowed Wilson back in front. From there over the final laps it was a tight battle for victory, but Wilson was able to remain composed and stretch a slight advantage in the closing two laps for the moto. Behind them, Nathan Crawford rebounded from two early crashes for third, while Jed Beaton made his way through the pack from well back to fourth. Kiwi Rhys Carter was next best in fifth with a consistent effort, trailed by Hamish Harwood, Dylan Wills was was third early before a light crash, Wade Hunter, an impressive Dylan Gosling and Taka Katusya, who came from the rear of the field to 10th. It was a disastrous moto for title threat Caleb Ward, who pulled out of the moto in the opening laps and he wouldn’t return for the round, now due to undergo scans on a knee injury next week. An incredible second moto went to Clout, who shadowed Wilson for much of the moto before overtaking him in the final laps for the race and overall victory – his second consecutive at Appin. The win sees Clout regain the red plate, after Beaton had another bad start to end up sixth this time around. Completing the race podium was Katsuya in yet another convincing performance, with Nathan Crawford and Wade Hunter filling the top five. Behind sixth-placed Beaton was fast-starter Rhys Carter, Dylan Wills, Dylan Leary in his best result of the season to date and Hamish Harwood. Overall it was Clout the victor from Wilson and Crawford, which sees Clout move to the top of the ladder over Wilson and Beaton, who was fourth overall today.